Stony Blyden wears black high top Converse All Star “Chuck Taylor” sneakers in the series. Hunter Street is a Nickelodeon comedy adventure series that premiered on March 11th, 2017. The show follows a group of five foster kids who are trying to find their missing foster parents while living in Amsterdam. Hunter Street features an ensemble cast led by Stony Blyden as Max, a street-smart troublemaker who is always looking for adventure. MaeMae Renfrow is the independent and book smart Tess, and Kyra Smith is the youngest of the bunch, Anika. Daan Creyghton is Sal, the brains of the operation, and Thomas Jansen is Daniel, the protective and athletic eldest member of the group. Max is the newest kid to join the Hunters. On his first night in his new home, he and the rest of his siblings wake up to find their foster parents, Erik and Kate, have disappeared. In order to find their parents, Max, Tess, Anika, Sal, and Daniel must team up and solve the mystery. There are many obstacles along the way, and they must keep their new family together when things get rough. Through it all, they have time to have fun and enjoy their adventures, never stopping in their ultimate goal to find their foster parents and reunite the whole family. Max after a nasty fall through a secret passage. While the show features an ensemble cast, its main focus is Max, and he can always be seen wearing Chuck Taylors. His sneakers are specifically a pair of classic, black high tops, and they can be seen in several scenes throughout the show, and in much of the promotional materials featuring Max. The chucks add to Max’s street smart, adventurer persona, and the dirt and grime on them show how much exploring he does. The show is lighthearted, and kids will enjoy the humor. The production is also top notch and it’s shot in an interesting fashion. Overall, Nickelodeon’s Hunter Street is a good addition to the networks comedy lineup, adding mystery and adventure to a wholesome tale about family. 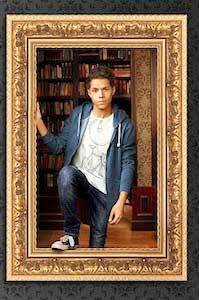 Promotional still of Max walking through a picture frame in his chucks.